Can 4K save the struggling TV industry? Can 4K save Sony's TV business? Will 4K Ultra HD be the saviour of the beleaguered TV industry? Increasingly, that's how some executives seem to be painting it. Despite having next to no native 4K content to drive sales, upbeat analysts seem to be revising their market expectations upwards on a monthly basis. Speaking at its recent European product forum, Samsung Euro Chief Sunny Lee proclaimed the 4K TV market was set for "explosive growth." It'll be 14x bigger this year than last, he enthused. By 2017, Lee predicts annual European shipments of 4K TVs will hit 3.3m sets. The CEA (Consumer Electronics Association) seems equally optimistic, estimating that in the US 485,000 screens will ship this year, generating $1 billion in revenue for the first time. 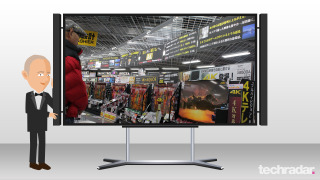 Apparently 73 per cent of US adults who see a 4K TV in store want one. Ka-ching! The market seers at Futuresource Consulting note that our increasing love of large tellies (and by that they mean 45-inches plus), will account for 23 per cent of the market by 2017, and by then pretty much all will be 2160p. So the future's looking rosey, right? "The hard truth is that TV has turned into a penguin business, i.e. it's unlikely to fly again, despite huge technology leaps." The hard truth is that TV has turned into a penguin business, i.e. it's unlikely to fly again, despite huge technology leaps. Sony's recent announcement that it's hiving out its TV division into a wholly owned company says it all. Unable to deliver on a promised return to profitability (on the bright side, the group will only lose 25 billion yen this year), it's being set up as a fiefdom. Given Sony's aggressive restructuring plans, things could have been worse. It wasn't beyond the realm of possibility that Kaz Hirai could have pulled the plug on TV completely as he did with Vaio. Thankfully, the CEO believes the sector is "still important," probably because it's more synergistic than Vaio to the rest of the Sony portfolio. It's undoubtedly a shrewd move. With Sony TV a separate entity, it becomes far less toxic to Sony Corp, and could possibly reap dividends in any potential sale (not that that's being mooted). The good news for the rest of us and indeed, Sony's various global sales operations, is the change really won't have a great deal of impact. When I reached out for a comment from Sony UK, a spokesperson pointed out that Sony remained committed to increasing its "4K TV options," and there's no slowdown in Full HD TV either. "In some areas, big screen 2K TVs are still very popular and Sony doesn't have any particular goals to decrease the number of models it offers," I was told. Sony's stated strategy will be to focus increasingly on high-end screens, both 4K UHD and Full HD. It'll also chase emerging markets. Admittedly this news could set alarm bells ringing; similar noises were heard from Pioneer and Panasonic, and neither of those plans played out particularly well. But I reckon Sony can buck the trend. Within the corridors of its downsized Tokyo HQ, executives will be buoyed by the news that in its local market at least the company has more than 75 per cent share in UHD TV, and it's dominant Stateside too. All of which goes some way to explaining Samsung's ambitious curved screen gambit. By making UHD (note that Samsung is downplaying the 4K branding) as much a design choice as a picture quality one, it cleverly mitigates the lack of content argument and encourages trendsetters to upgrade faster than they actually need to. Crafty buggers. So will 4K save the TV industry? Probably not. But it will stop the business spiralling into a maelstrom of mid-priced cheapies distinguished only by the amount of club card points they accrue when thrown into the weekly shopping basket. And for that we should all be 8 million pixels grateful.